Photo: Notice Of Intent To Take This Property By Eminent Domain. 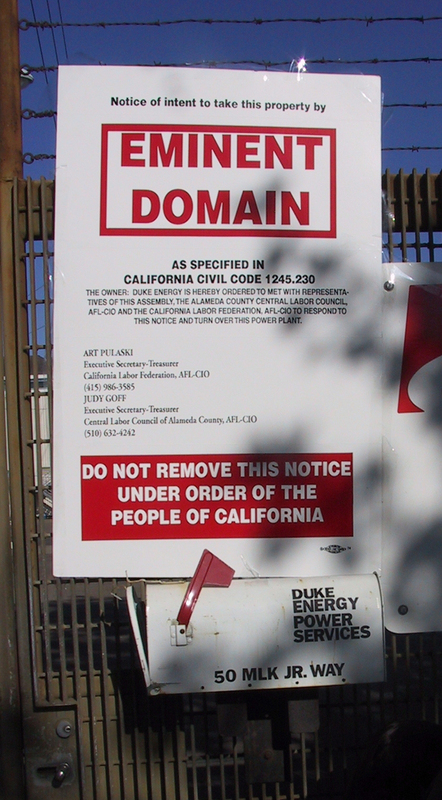 Sign left by protesters at Duke Energy power plant in Oakland, CA. outside of Duke Energy power plant near Jack London Square in Oakland, CA. “*The FERC Federal Energy Regulatory Commission to impose wholesale energy price controls! *The Energy Pirates (like Duke Energy) must pay an Excess profits tax! Many people feel that the time to seize the power plants and create Public Power (like Sacramento and Los Angeles) is now! Go to www.powertothepeople.org for information about, and solutions to, the California Energy Crisis.